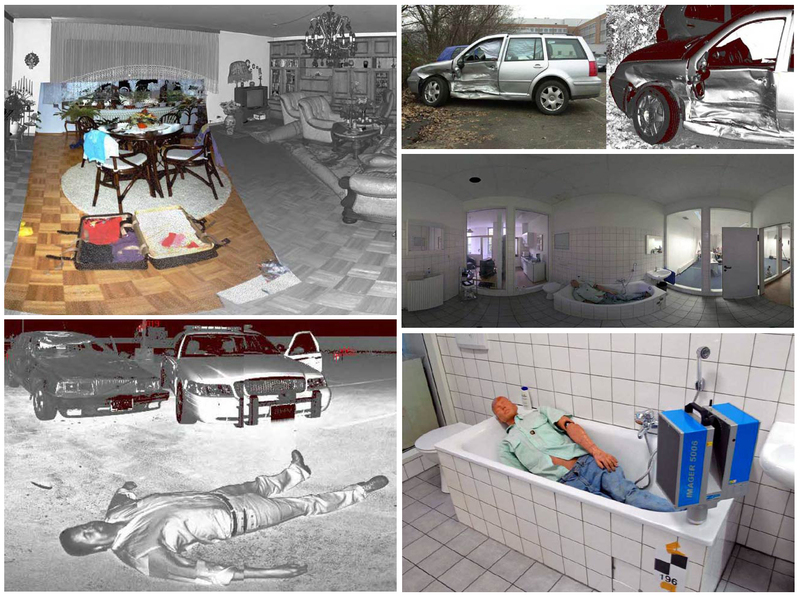 Laser Scanning is a valuable tool for Forensic applications because of the ability to preserve a crime scene long after it has been examined. Every point is defined by its' XYZ co-ordinates, and any 3D measurement or angle can be obtained with ease. All high resolution laser scans can be assembled into one complete point cloud model, which is a virtual re-creation of the scene with all geometry preserved. The documentation of a crime scene aids law enforcement at the time of the investigation by providing relevant scene data, but also allows investigators to refer to the crime scene in its' untouched state for years to come, another invaluable asset to laser scanning. It provides the opportunity to view the scene for any angle or viewpoint, and may even capture important information that was not recognized at the time of site evaluation. It also helps to prove inaccuracies in witness statements, as statements can be checked against the precise data to prove or discount the statement. Point cloud scene can be modeled and animated for study or courtroom presentation. ©All Rights Reserved 2015 Reality Measurements Inc.